It’s may seem strange to use the word smorgasbord for thai food, but there’s no other way to describe the variety of dishes my family and I had at Pad Thai Cafe last night. 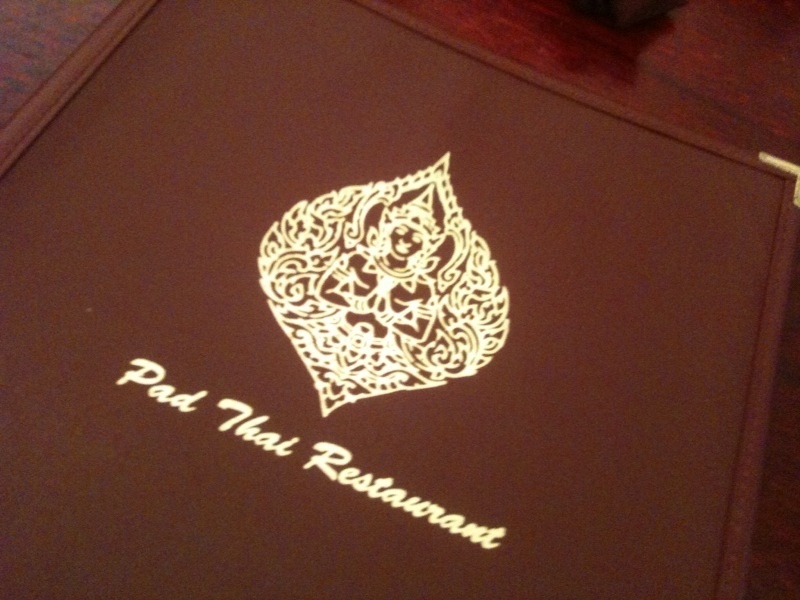 Food: PT’s menu is huge, offering over 60 different Thai dishes. We decided to share a variety of things so we could sample something from each section (curry, noodles, seafood, etc.). We started the meal with three appetizers–an order of fresh spring Rolls with shrimp and pork ($4.75), an order of vegetarian fresh spring rolls ($4.25), and an order of vegetarian deep-fried egg rolls ($4.00). I really enjoyed the flavors of the fresh spring rolls–there was a bit of basil in each bite, which I love. And the dipping sauce was wonderful–sweet and salty with a hint of fish sauce and finished with crushed peanuts so you get a big of nutty crunch. Each order comes with 4 pieces, so they’re good appetizers to order if you’re sharing with a group. 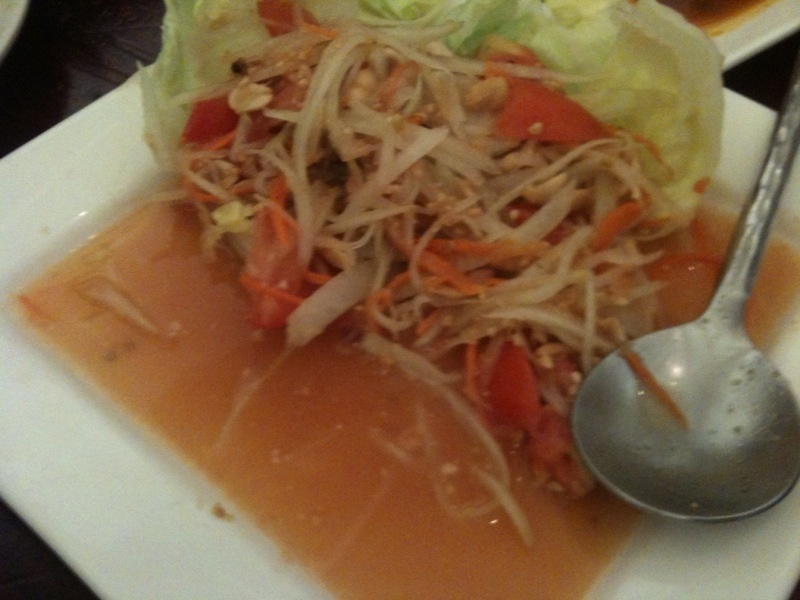 If you haven’t tried Papaya Salad before, it’s like a really fresh coleslaw without any mayonnaise. The texture comes from the fruit–Green Papaya isn’t at all like what you might expect if you’re imagining something like a mango. It is actually slightly tart and very crunchy. The sauce is very rich–in addition to lime juice, traditionally it includes some shrimp paste, fish sauce, and honey, so the flavor is tart, slightly sweet, and salty. Gang khiao wan (vegetable green curry) ($8.50) is a must-order if you ask me. There’s nothing like bamboo shoots, green beans, thai eggplant, and sweet basil and lime leaves that have simmered in rich, creamy sauce made of coconut milk and green chili paste. 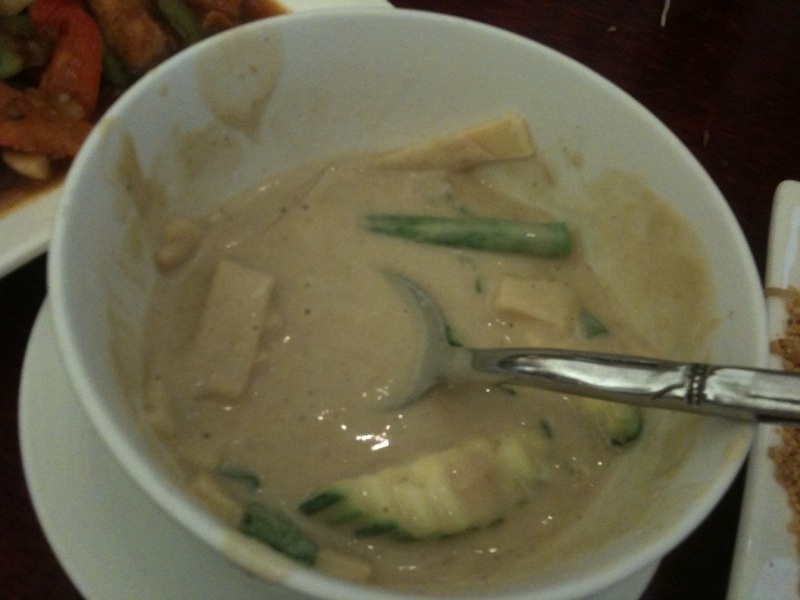 Green curry: sweet with a bit of heat.The vegetable in the front that's cut into a half moon shape is Thai Eggplant. PT uses Thai Eggplant in their green curry, which is the authentic way to prepare the dish, rather than using traditional purple eggplant that more Americans are familiar with. As a result, the flavor of the curry sauce was excellent. However, there weren’t as many vegetables as I would like. It was as though the chef put in the same amount of veggies that would be in the dish if we had ordered chicken or shrimp green curry and because we had no protein the sauce to veggies ratio was off. 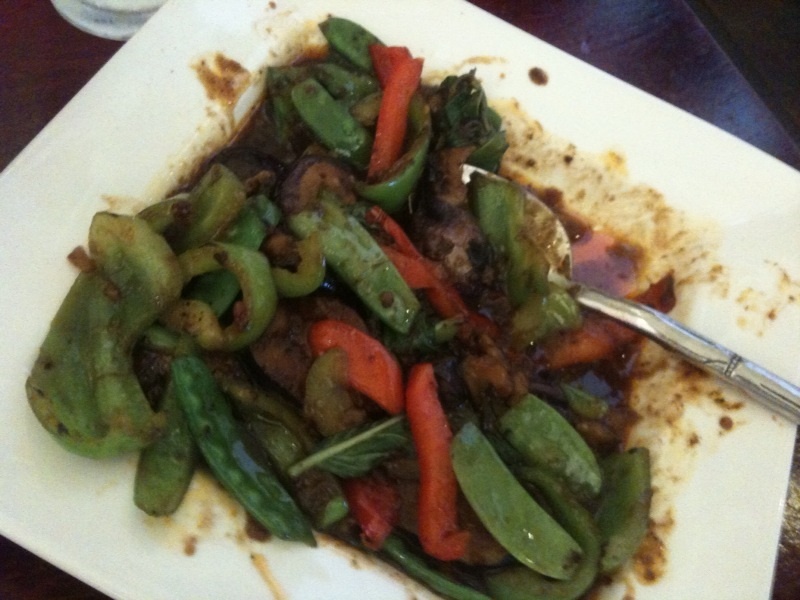 The texture of the soft eggplant with the sautéed, but still crispy peppers was wonderful. I love the taste of thai eggplant–it’s a bit peppery, sort of like the pepperiness that arugula has. 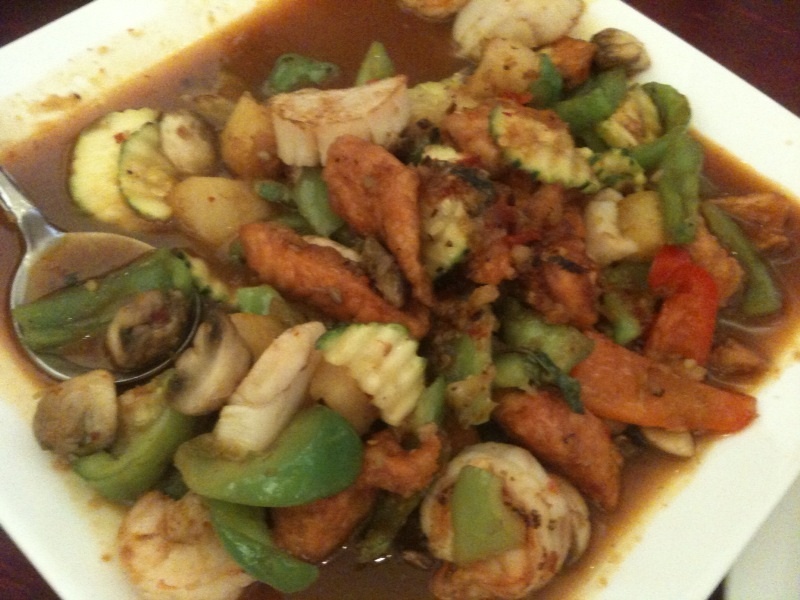 We ordered the dish as “medium” spiciness and next time I would ask for more heat–it wasn’t very spicy for my taste. 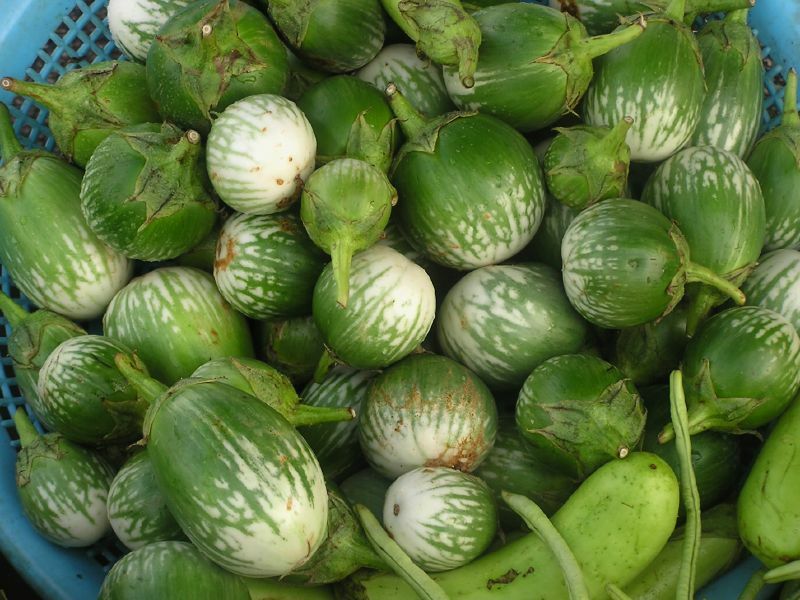 Thai Eggplants are small and green, and often have a white marking on them. It was really fun to try this dish. If you’re a seafood lover, you’ll get your seafood fix here. The dish includes shrimp, large diver scallops, and generous chunks of salmon, which I thought was especially delicious with the slightly sweet sauce. 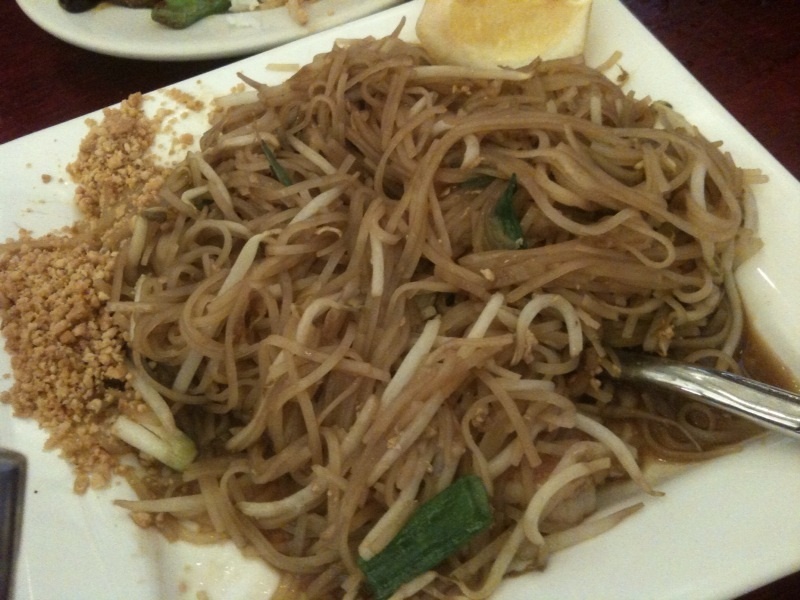 The pad thai was very, very good. But I have to say that the sweetness of the gravy was a little too sweet for me–I prefer a bit of tanginess. We squirted an extra slice of lemon over the noodles, which cut the sweetness. My other complaint is that there wasn’t much shrimp. Drink: We ordered sodas ($1.95) and a hot tea ($1.25). PT did have some good beers listed on their menu, for those who might be interested. Service: Our waitress, Oula, was very friendly and attentive, as were the bus boys who kept our sodas refreshed and our water glasses full. Scene: This is a great restaurant to go to with your family or a big group of friends. The restaurant is full of big, wide booths that can accommodate larger parties, which we really appreciated. It’s located near Macalester College, so you’ll see lots of college students and 20-somethings. The decor is simple, but has some Thai flair, including a fantastic painted mural on one side of the restaurant that wowed us all. Dress: Jeans and a t-shirt are fine. Throw on some jewelry or a nice pair of shoes if you feel like dressing up. Cost: My wonderful Mom treated us all to dinner. Thanks, Mum! Total, the tab with tax and tip was $106, which would have been about $27 if we split the bill four ways.